The members of the STI/SPFA Field Erected Tank Section build steel tanks that meet or exceed the requirements of AWWA, NSF, API and industry standards. Members of STI/SPFA produce elevated, reservoir and standpipe water storage tanks. They also produce storage tanks for the petrochemical industry and special storage systems. Tanks can be designed to hold from 50,000 to several million gallons, are provided with foundations, and often finished with elaborate painted graphics and color schemes. Tanks may incorporate cathodic protection and piping. Some water tank designs allow for several floors, office space and other facilities. Private, municipal, and industrial water system engineers and operators specify steel tanks for their reliability, long-term value, and low, predictable normal maintenance. Click the tabs below for more information. Be sure to scroll down each tab. Our TCO tool is free to all users. Click the Total Cost of Ownership tab above. How to use and interpret water tank standards and AWWA Standards review. Seismic designs and selection considerations. Impressed current and galvanic (sacrificial) anode cathodic protection systems. Lower VOC coatings and linings. Using an accurate life cycle analysis (LCA) to determine the best tanks for your needs. Click here for upcoming seminars and informations. How to update your system or specify a new tank. Presenter Steve Meier, Tank Industry Consultants, is an industry expert who helped to write the new AWWA Standard. Explains foundations, inspection/testing, field construction, welding and shop fabrication during the tank construction process. Presenter: Kevin Gallagher, Caldwell Tanks. STI/SPFA's Total Cost of Ownership (TCO) web-based tool provides real-world data on fabrication, inspection, maintenance, touch-up, and repair costs for steel tanks versus other materials. Users can also input their own data, allowing "apples-to-apples" comparisons that reflect the real costs for differing materials over their entire life cycles. The TCO cost analysis tool assists water system managers to analyze the total cost of ownership of three common types of flat-bottom, ground supported water storage tanks (with roofs) constructed in accordance with AWWA standards: Welded Steel Tanks: AWWA D100; Bolted Steel Tanks: AWWA D103; and Concrete Tanks: AWWA D110 or D115. Access to the TCO tool is complimentary for all users, but you must register. Then you can input and store data related to your tank or tank project, and/or study the default data presented in the program. There is no limit to the number of tank projects you can store here. Your data is retained for one year and is secure, only available to you. Members of STI/SPFA produce both the common types of water tanks--elevated, reservoir, and standpipe--and special storage system products. STI/SPFA honors the owners of steel water storage tanks at least 100 years old and still in active service with recognition as a member of the STI/SPFA Field Erected Storage Tank Century Club. "Water tanks are some of the most identifiable structures across the United States, and we feel it is important to honor these tanks not only for their extraordinary service life, but also for the role they play in ensuring the safety of our water supplies," said Kevin Gallagher, Caldwell Tanks. If your water tank has been continuously in service for 100 years or more, we invite you to enroll in this honorary program! Each year, STI/SPFA acknowledges Member companies with Tank of the Year Awards in all categories, to recognize tanks that best represent the advantages and flexibility of steel construction. These booklets are essential to your company's safety orientation program. Order on the Publications order page. 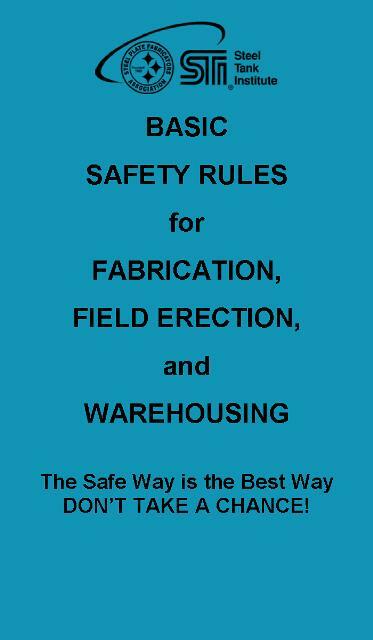 Basic Safety Rulesbooklet for warehousing, fabrication and construction.This booklet serves many members as their company's rule book. 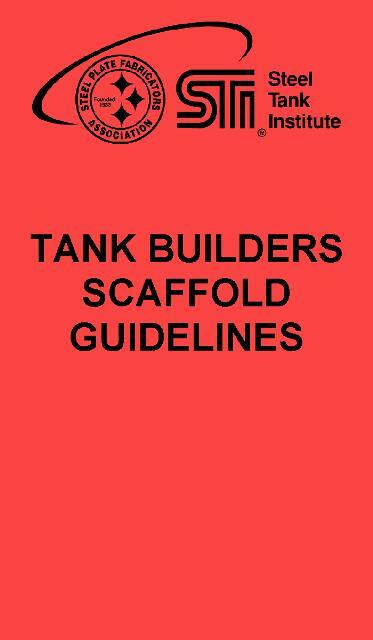 Tank Builders Scaffold Guidelinesbooklet can be used alone or complimented with theTank Builders Scaffold Guidelines Presentationavailablehere. Purchase this publication from the AWWA website. The design, construction, operation, and repair of steel tanks for potable water storage are the topics covered in this engineering reference handbook. 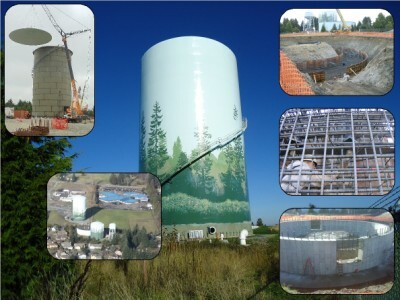 All types of steel water tanks and included, both ground-supported and elevated. Chapter topics cover tank configurations, location, appurtenances, codes and regulations, corrosion control, foundation, welded tanks, bolted tanks, operation, maintenance, inspection, cleaning, rehabilitation, repair, and security. Author Stephen W. Meier, PE, SE, Chair of AWWA's Steel Tank Committee, is one of the foremost experts on concrete and steel structures for water storage. Purchase this valuable reference from the AWWA website. This engineering reference (both volumes in one book) is revised and updated. It is a joint project of STI/SPFA and the American Iron and Steel Institute (AISI).